Tell A Friend about Ann's Page! 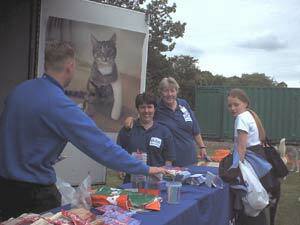 Once a year, a Training Day is arranged for PDSA's Volunteer Trust Officers. Although I resigned as a VTO in order to concentrate on helping PDSA through the Catsup website, they very kindly still invite me to come along and take part. It helps me to keep up with what's happening within PDSA and is always an interesting day. 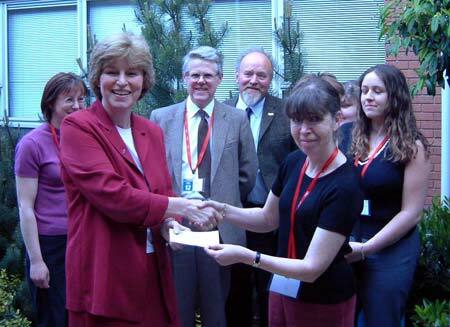 The last training day was on 24th May and I was able to take a cheque for £1,000 with me to present to the Director General on behalf of Spock and Dracs. (They had an urgent appointment with a duvet and couldn't present it themselves.) Of course I took pictures to record the event and you can see them below.. 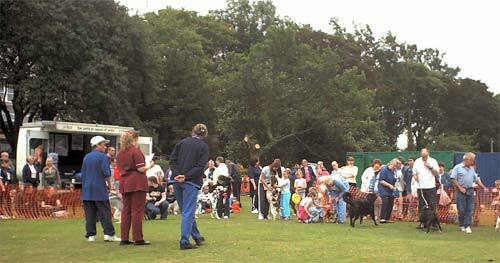 I'm friendly with PDSA's local volunteer fundraising groups and on 6th July, the Gateshead Group held "Scrufts", their biggest fundraising event of the year at Saltwell Park. 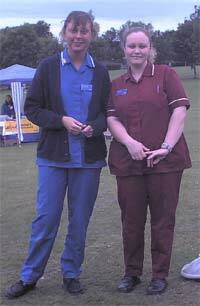 Jen, Ann from Winlaton and I were there. Scroll down to see pictures of it. The journey down to Telford is a long one, even when the trains are on time. Unfortunately they weren't the day I travelled and a 5½ journey turned into an 8 hour one. (Thank you Virgin!) I just made it to the hotel in time for dinner with some of my fellow volunteers and Trust Manager David Cooper. 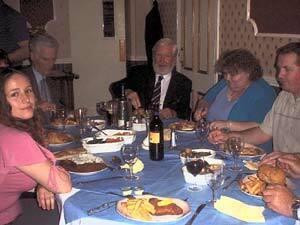 Left to right: Samantha Finnegan, Peter Fullick,, David Cooper, Deb Butler, Deb's husband. That's my plate of fish and chips that is going cold in the foreground. 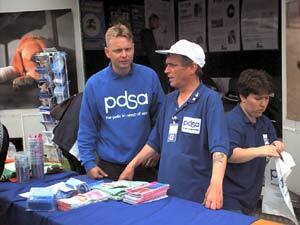 The following day, we were joined for coffee by Hugh Thomas, PDSA's Director of Marketing. 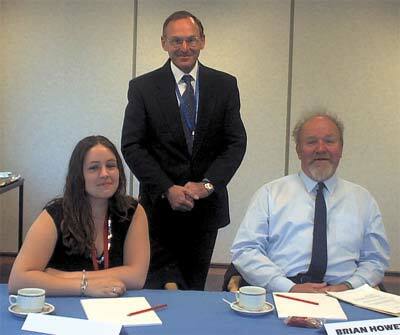 Hugh is flanked by Samantha and Brian Howett in the picture below. PDSA's Director General, Marilyn Ryström always spends some time with the group, giving an overview of PDSA and talking about plans for the future of the charity. This year, she also joined us for lunch. Immediately after lunch I gave her the boys' cheque. Left to right: Penelope Penny, Marilyn Rydström, Phillip Morgan, Brian Howett, Deb Butler (partially hidden), me, Samantha Finnegan. No page about Catsup's fundraising would be complete without a picture of David Cooper, the Trust Manager, with whom I liaise and who has given me a great deal of support. David also supplies much of the information I use for the "Latest News" on Catsup's PDSA page. 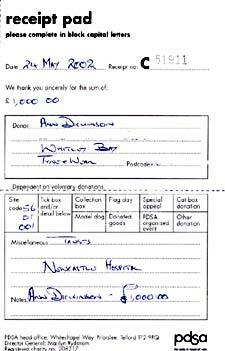 David's the one who processed the boys cheque and sent me an official receipt. Naturally the boys demanded a meeting as soon as I got back so that I could report every little detail of the cheque presentation to them. You can help Catsup's fundraising online, by visiting the Catsup Shop. 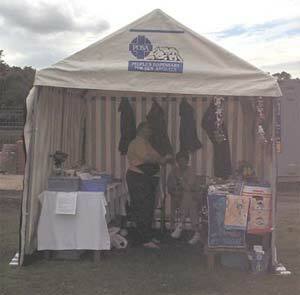 All the profits are given to PDSA. To visit PDSA's official website, click here. Paul Wharton, Nigel Cooke and Helen Ainsley. Paul is the Area Fundraising Manager and had driven up from Leeds to help out. 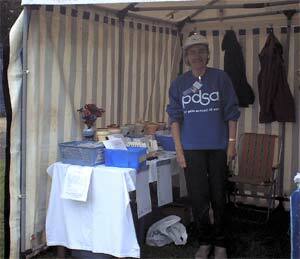 Nigel and Helen are volunteer members of PDSA's Gateshead Fundraising Group and do most of the very considerable organising needed to run "Scrufts"..
Paul, Helen and Jean Garrett. Jean is chairlady of the Gateshead Group. 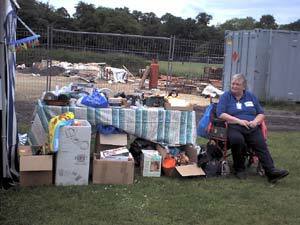 Mary Forsyth is the lady in charge of the bric a brac stall. Mary Hayden with a couple of supporters during a quiet moment on the tombola. 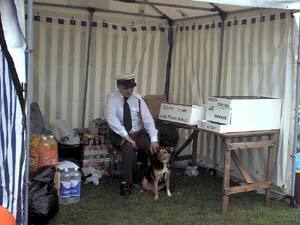 Nigel and Jean look on as business starts to pick up for Mary. Ian McNab seemed to have several roles, but here he is in charge of a couple of sideshow type games.Nigel's dog Caiyra is keeping him company. Those of you who have read the boys books will know the name "Ann from Winlaton". 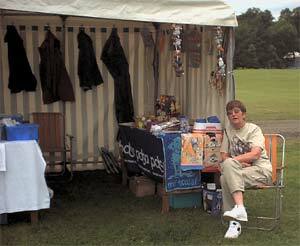 She was in charge of one of the Gateshead Group's stalls and helped me and Jen with the Catsup stall too. Sheila who is involved with a small local veterinary charity (P.A.W.S.) and Jen have a chat. 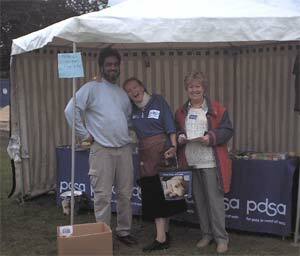 Jen gives Ann from Winlaton and me a break and looks after PDSA's stall (right) and the Catsup one (left) for a while. 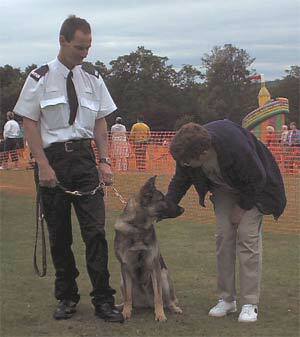 One of the attractions was a display by police dogs. 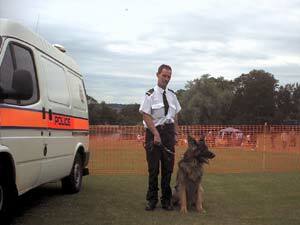 This is Jake and his handler Vince. Vince is with Billy this time and that's Jen passing the time of day with him. 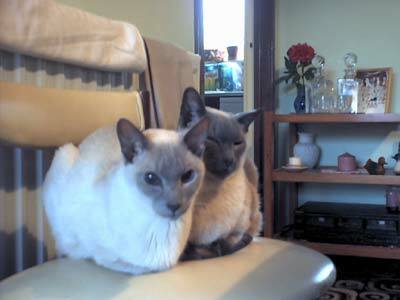 Jake (left) and Billy (right) were beautiful. 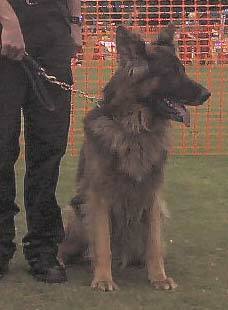 Jake was massive, and watching him tackle a well padded fake ruffian was enough to make anyone think twice. 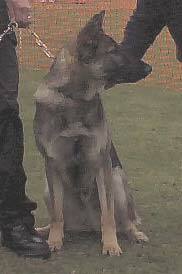 But when Vince invited me to give Jake a fuss, he thoroughly enjoyed it and leant into my body, just like Spock and Dracs do, although I did notice a weight difference! You can never be sure what you'll find on Ann's Page. It changes approximately every 6 weeks and it's completely different each time. If you'd like to see what was previously on Ann's Page, click on one of the links above or go to our Archives If you'd like to know when Ann's Page changes, please feel free to join our mailing list.